Spatial Dimensions of Public Policy deals with the spatial dimensions of public policy with particular reference to resource management, urban development, regional development, and poverty alleviation. Emphasis is on the geographer's actual and potential contributions to public policy. Comprised of 15 chapters, this book begins with an introduction to the nature of geographers' contributions to public policy and the reasons why they have not been as effective as the relationships between their interests and important issues of public policy might suggest. The next chapter describes how policy decisions are made in Canada and reviews the nature of disciplinary contributions to governmental decision-making at the highest level. Subsequent chapters focus on regional policy and broad issues of world strategy; specific contributions to public policy, particularly in the United Kingdom; spatial aspects of pollution policy; and policies outside the United Kingdom. Energy policy in Western Europe is discussed, together with a geographer's contribution to addressing environmental problems in New Zealand; the difficulties of achieving an accurate population census of Nigeria; and the reshaping of the legislative and congressional districts of the State of Washington. 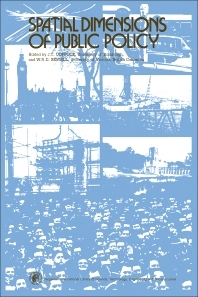 This monograph will be of interest to geographers and public policymakers.